Ciara casually poses on the cover of Footwear Weekly. The covers comes in support of her recent partnership with Keds which is one of many financially beneficial partnerships for the singer. For the past few years Cici has been known as a very stylish fashion forward diva. 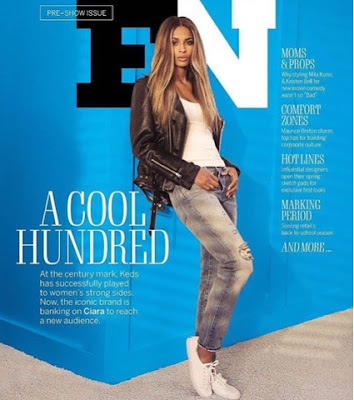 Recently Ciara married football player Russell Wilson & has been working hard on her seventh studio album that is the follow-up to the Jackie album. Hopefully the next album will produced crossover hits like "Dance Like We're Making Love".